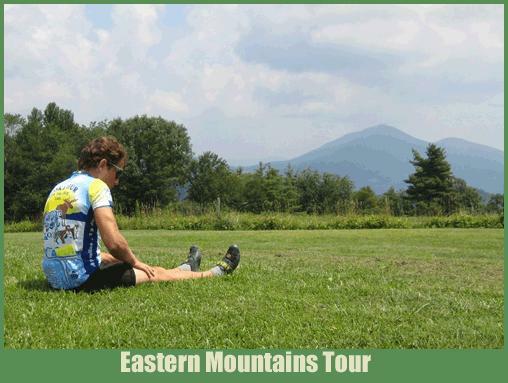 This is our Fifth Eastern Mountains Tour. During 17 riding days we will travel 1,668 miles south along the ridge of the Appalachian Mountains and Blue Ridge Parkway. Total climbing will be 101,000 feet which is about the same as the Northern Transcontinental in half the distance. 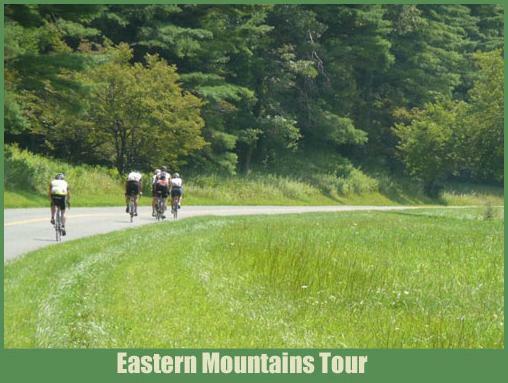 Lon has scouted over 500 miles of new roads to include in this edition of the Eastern Mountains Tour. The daily average of 98 miles per day will be a good challenge for for serious riders. ATTN:This is a climber's tour and everyone should be able to average 12 mph with stops. Slower riders will be sagged forward to be back on pace with the group. The seaport of Portland, Maine is a nice place to start the tour within easy access of Boston or Manchester, New Hampshire airports. The weather in New England during September will be pleasant for cycling as we ride south before the change of seasons. As we leave Maine we cross over the Green Mountains of Vermont and White Mountains of New Hampshire. Many of the small rural towns haven’t changed much in 100 years. A small white church and general store are main attractions in towns. This is a way of life in many eastern mountain communities. We will cross countless scenic valleys famous for covered bridges and well kept farms. We ride into New York State after three days. On Saturday, September 10th we ride through Cooperstown, NY. If you are a baseball fan you can spend a few hminutes at the Baseball Hall of Fame gift shop. Continuing into Pennsylvania the mountains will challenge us with many climbs over five miles long. On the sixth day leaving Breezewood, Pennsylvania, a highlight is the 18% truck grade sign at the top of a big hill. This grade is a stinker and probably the steepest hill of the entire tour. Pennsylvania is picturesque with the Amish farms and horse drawn buggies. The road network offers fantastic routes for cycling. By the time we reach Virginia we will be really fit to start riding the 569 miles of Skyline Drive and Blue Ridge Parkway. This is one of the classic cycling routes in America which has several climbing days over 10,000 feet in 100 miles. The finish at Stone Mountain, Georgia is a historical Civil War park which is a fine place to conclude our vigorous tour through the mountains. It is an easy shuttle to Atlanta's International Airport. 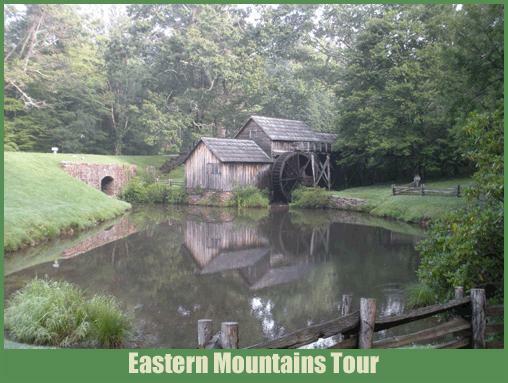 The Eastern Mountains Tour exposes you to areas of the United States unique for their history and charm. This is not an easy bike ride. You should not attempt if you cannot train as much as you would for a coast to coast tour. However if you do like long rides through some of the best scenery in America this is a good tour for you. Although this tour will be similar to past Eastern Mountains Tours we have changed 10 of the 17 hotels to offer improved accommodations during the tour. We think you will like the changes we have made to the route and lodging to make this tour a new and unique PAC Tour.